Before Disney World ruined everything, there used to be a slew of great roadside attractions in Florida that were cheap, sometimes sleazy and always satisfying! I was fortunate to have visited the Tragedy in U.S. History Museum in St. Augustine, the Cypress Knee Museum in Palmdale (where I met the legend himself, Tom Gaskins! ), Boardwalk & Baseball in Haines City, Ocean World in Fort Lauderdale and Xanadu: Home of the Future in Kissimmee before they closed their doors forever. Join us as we revisit some of the most classic Florida roadside attractions (long gone, but never forgotten!). One of the most desperately themed attractions in Florida history, Boardwalk and Baseball opened as a turn-of-the-century, Atlantic City-style seaside boardwalk on Valentine’s Day 1987 on the site of what was formerly known as Circus World (1974-86). New owners Harcourt Brace Jovanovich (HBJ), which sold the park to Busch Entertainment Corporation in 1989, built the state-of-the-art “Baseball City Stadium” just North of the theme park and managed to lure the Kansas City Royals there from Fort Myers for its new Spring Training home. Highlights of Boardwalk and Baseball included roller coasters (including “The Florida Hurricane”) The Grand Rapids flume ride, IMAX theater and the Royal Lippizaner Horse Show. However, the theme park had no luck attracting guests with Walt Disney World Resort less than an hour to the North. In addition, the park did not add any new rides or attractions after it opened. Interestingly, Boardwalk and Baseball closed at 3 PM on the afternoon of January 17, 1990, without any warning and while approximately 1,000 guests were still in the theme park! The former Circus World/Boardwalk and Baseball site is now home to the Posner Park shopping complex. 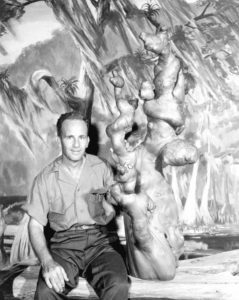 Visionary Tom Gaskins first became fascinated with cypress knees in the 1930s and his obsession evolved into a famous roadside attraction along U.S. 27 in Palmdale that boasted a museum, cypress knee factory, gift shop and crudely designed catwalk through a cypress swamp. Signs along the highway would beckon tourists to stop at the museum with messages such as “Lady, If He Won’t Stop, Hit Him On Head With Shoe.” A barefoot Gaskins donning his favorite cypress hat would often greet visitors and give them a highly entertaining tour of the facilities, along with some of his favorite cypress knees such as the one that resembled a “Lady Hippo Wearing a Carmen Miranda Hat.” Gaskins even self published a book in 1978 called Florida Facts and Fallacies. The “About the Author” section of the book states that Gaskins “worked with and was salesman for Gator Roach killer until 1934 when he married Virginia Bible and started the cypress knee industry . . . The Cypress Knee Museum was opened in 1951 . . . [Gaskins] is a woodsman, hunter, fisherman, woodcarver, physical culturist (jogged eleven miles on his 69th birthday), member of John Birch Society, said-to-be wit and philosopher, and wood-be perfectionist. He holds ten U.S. patents.” Unfortunately, with the arrival of the Florida Turnpike, I-95 and I-75, tourist traffic along U.S. 27 dried up and the Cypress Knee Museum hit hard times. Gaskins passed away in 1998 and his son, Tom Jr., tried valiantly to keep the museum open but was forced to close up shop in 2000 after a break-in. One of the most controversial Florida attractions (it was owned by the People’s Republic of China), Florida Splendid China was a 75-acre, $100 million theme park that opened its doors in 1993 just West of the main entrance to Walt Disney World Resort off bustling U.S. 192. Highlights of Splendid China included meticulous miniature replicas of The Great Wall of China, The Forbidden City, Potala Palace, Leshan Grand Buddha Statue, Terra Cotta Warriors of Xi’an and more. In addition Chinese acrobat shows were scheduled throughout the day and the park later added the “Magical Snow Tiger Adventure.” However, there were no rides or other attractions and Central Florida visitors and locals alike stayed away in droves (the park did attract its share of human rights protesters at the front gates). Splendid China ultimately closed on December 31, 2003, and the ruins of the park soon became a haven for skateboarders and graffiti artists. Its sister park in Shenzhen, China, Splendid China Folk Village, remains open to this day. Also once known as “Uranium Valley and Caves,” the Ocala Caverns were located on U.S. routes 301, 27 and 441, approximately eight miles South of Ocala. According to legend, the caverns were used as a hiding place by runaway slaves during the Civil War. The Ocala Caverns were open to the public as an attraction in the 1950s and 1960s, and at one time owned by a pro wrestler known as “Man Mountain Dean Jr.” and “Mighty Jumbo” (real name: Samuel Hesser), who weighed in at nearly 650 lbs., and Violet Ray, “Women’s Lightweight Wrestling Champion.” Attractions included two caves (one dry, one wet), an underground boat ride (basically Hesser kicked the rowboat out so tourists could get a glimpse of the cave and then he pulled it back with a rope), Callaway’s Rock Display, Inca Indian Museum, Wrestling Hall of Fame and Santa Claus Land (Hesser even made the December 1966 cover of the Ocala-Marion County Visitors Guide to the Kingdom of the Sun dressed as Santa Claus). The attraction closed in the late 1960s or early 1970s, and Hesser reportedly passed away from a brain tumor at the age of 51 in Iowa in 1974. In recent years, the Florida Speleological Society has made efforts to clean up the Ocala Caverns site. Opened in 1966 by Recreation Corporation of America, Pirate World was an 87-acre “buccaneer-themed” park that featured a variety of thrill rides and attractions, including the Wild Mouse Roller Coaster, Grand National Steeplechase Ride (rumored to be the original from Coney Island), Crows Nest Observation Tower (formerly used as the Belgian Aerial Tower in the 1964/65 New York World’s Fair), pirate ship ride, log flume and carnival games. Pirates World also became known for booking top rock acts over the years such as Led Zeppelin, the Grateful Dead, Black Sabbath, Pink Floyd, the Doors (sans Jim Morrison), Alice Cooper and the Beach Boys. Police often clashed with the frequently unruly, drunk and/or stoned teenage concertgoers. Pirates World experienced a sharp decline in attendance after Walt Disney World Resort opened in 1971, filed for bankruptcy in 1973 and closed for good in 1975. Over the years, condominiums sprouted up on the site of the former theme park. A Wild West-themed amusement park that opened in 1963 near Silver Springs, Six Gun Territory boasted a replica of an authentic 1880’s Western town – complete with a courthouse, bank, schoolhouse, church, Frontier Hotel and courthouse – which served as a backdrop to choreographed gunfights throughout the day. Meanwhile, can-can dancers performed at the Palace Saloon. Six Gun Territory also featured an Indian village, train ride and carnival rides, as well as restaurants and gift shops such as the El Sombrero Café, Six Gun Apothecary, Cousin Will’s Variety Store and Miss Kitty’s Ice Cream Parlor. Six Gun Territory’s sister theme park, Ghost Town in the Sky, was located in Maggie Valley, North Carolina. Admission in the early years was just $2 for adults and $1 for children. The cover of Molly Hatchet’s 1983 album, No Guts…No Glory, was reportedly shot at Six Gun Territory. The arrival of Walt Disney World Resort to Central Florida in 1971 – along with the diminishing popularity of Western-themed TV shows – helped hasten the demise of Six Gun Territory, which closed its doors for good in 1984. “See Jayne Mansfield’s death car – learn the truth!” Some considered it in bad taste but the Tragedy in U.S. History Museum once served as a Mecca for roadside attraction aficionados. Opened in 1965 as the brainchild of L. H. “Buddy” Hough, the museum (basically a cluttered residential house located across the street from the “Authentic Old Jail”) featured such artifacts as Lee Harvey Oswald’s bedroom furniture, a wax figure of Oswald peering out of a window labeled “Texas School Book Depository,” a train whistle from “the wreck of the old 97,” antique torture equipment, a copy of Elvis’ last will and testament, the ambulance that carted Oswald away, a leather jacket once worn by James Dean, a frame-by-frame display of the Zapruder film and a limousine that John F. Kennedy once rode in (not the infamous Dallas limousine). In addition, the museum boasted the “death cars” of Bonnie and Clyde (actually the car used as a prop in the 1967 Bonnie and Clyde movie) and Jayne Mansfield (although it was the wrong make of car). Hough, who once claimed that on a good day that museum would get 10 visitors, battled with the City of Augustine for years in his efforts to open (he had to take his fight to the Florida Supreme Court), maintain and publicize his attraction (callers to the St. Augustine Chamber of Commerce were told that the museum had closed and they were snubbed by all of the official travel guides). According to Hough, in a 1989 interview with the Florida Times-Union, “Every human being has a morbid curiosity.” In another interview, Hough stated, “Tragedy is what made us great as Americans. Tragedy is what sticks with people. And the things that go with tragedies are very valuable. People want to see them and remember them. I don’t care what others say.” Hough passed away in 1996, the museum closed in 1998 and all the artifacts were auctioned off. Built in 1983, the odd, bubble-shaped Xanadu: Home of the Future attraction off U.S. 192 was actually one of three Xanadu homes of the future (the other two were located in Gatlinburg, Tennessee, and Wisconsin Dells, Wisconsin). The name “Xanadu” was chosen as a homage to Kublai Khan’s summer capital, which inspired Samuel Taylor Coleridge’s famous poem, “Kubla Khan.” All three energy-efficient, dome-shaped homes were built of polyurethane foam and known for their curved walls and cramped rooms. However, the technology within the Xanadu homes became laughably dated quickly. Xanadu closed its doors in 1996 and became a haven for vandals and homeless squatters before being finally demolished in 2005. The abandoned Xanadu house was featured in the 2007 documentary, Urban Explorers: Into the Darkness.